For smooth operation, depress the brake pedal and the lock release button when shifting from N (Neutral) to a forward or reverse gear. Always check the surrounding areas near your vehicle for people, especially children, before shifting the shift lever into D (Drive) or R (Reverse). When stopped on an incline, do not hold the vehicle with the engine power. Use the service brake or the parking brake. 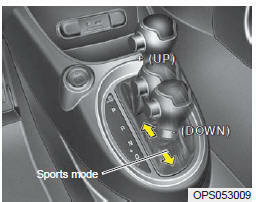 In contrast to a manual transaxle, the sports mode allows gearshifts with the accelerator pedal depressed. 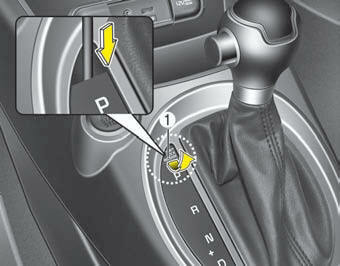 If the brake pedal is repeatedly depressed and released with the shift lever in the P (Park) position, a chattering noise near the shift lever may be heard. It is a normal condition. 2.Insert a screwdriver into the access hole and press down on the screwdriver.